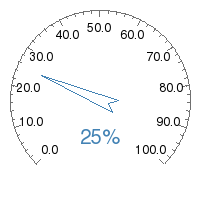 The lines of code above are the easiest way to create a gauge, however they do not draw on a lot of the features available in the module. This uses PIL to create a new image called im, 200 x 200 pixels big with a white background (255, 255, 255). More information on this function can be found here. This creates an instance of the gauge called g. Mandatory arguments are the minimum and maximum values on the scale, 0 and 100 in this case. 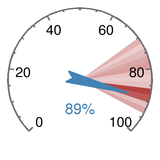 Here we use render_simple_gauge which is a helper function to render a simple gauge. major_ticks=10 and minor_ticks=2 draws large and small tick marks on the dial at 10 and 2 unit increments. If major_ticks is omitted then no dial will be drawn. 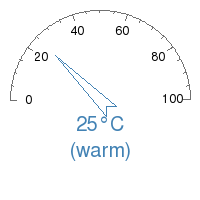 label="25%" adds a label in the middle stating the value the needle is pointing towards. If this is omitted then no label will be drawn. 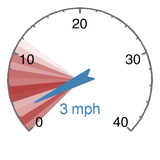 The gauge code has now rendered the gauge in the im image buffer. im.save saves the image, however at this point you are free to use PIL to manipulate the image buffer further. Instead of using the render_simple_gauge helper function, this code uses the individual setup functions for each element of the gauge instead. These allow more flexibility in how the gauge is generated. 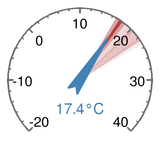 Here we prvent the major tick marks being labelled by setting dial_format=None. add_dial_labels() accepts a dictionary of values and corresponding text labels. im.crop() is a PIL function which chops off the bottom unused region from the gauge. The weatherstation gauges give an indication of conditions over the last 24 hours by shading the dial region. To add shading to the above, use the add_history() function. It accepts a list of values from which it computes a histogram split over the number of buckets specified. 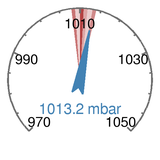 Here we use offset_angle=180 to rotate the gauge so a value of 0 (North) is at the top. 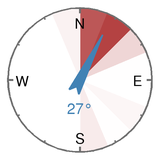 add_dial_labels() is used to plot the main points of the compass. 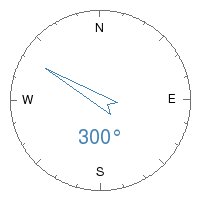 dial_range = any value between 0 and 360.
major_ticks and minor_ticks are how often to add a tick mark to the dial. Takes a dictionary and draws text at every key. Draws a needle pointing towards value. Adds multiple lines of text as a caption. Usually used to display the value of the gauge. (only works if add_needle function has already been called). Renders the gauge. Call this function last. 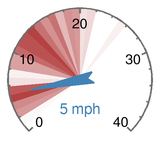 Does not support dial labels, histogram dial background or setting colors.